1. Preheat the oven to 200°C, gas mark 6. Reserve 30 whole pitted cherries and purée the rest, then mix with the almonds and sugar. 2. Unroll the pastry and cut 6 x 11cm diameter circles and place on a large baking tray. Spread with the almond-cherry paste leaving a 1cm border. 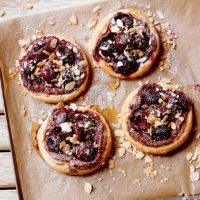 Place 5 whole cherries in the centre of each tart and bake for 15-20 minutes until golden. 3. Drizzle with honey, sprinkle over the flaked almonds and dust with icing sugar before serving warm.